Each winter, for the past 24 years, John Tilton and Lennie Kesl have put aside their usual studio pursuits, and turned their minds and imaginations toward a compelling collaboration. The product is a large group of painted plates, cups and jars. The appeal of this work reveals itself at several levels, as does the content. This is the work of two serious artists making the most of their talents and experiences, in concert. As it turns out, each is also a musician and, in both endeavors, they cook. 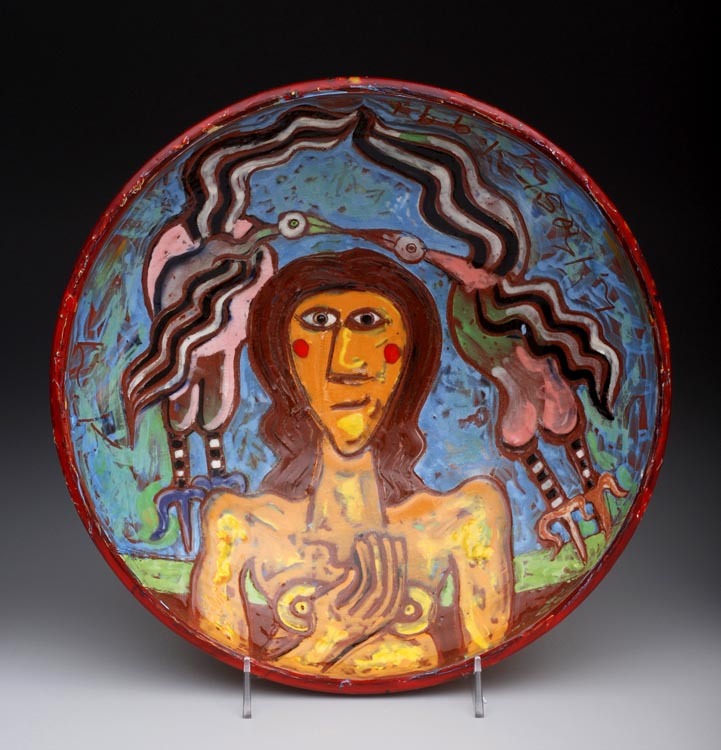 Tilton has been a well-known potter for a long time. 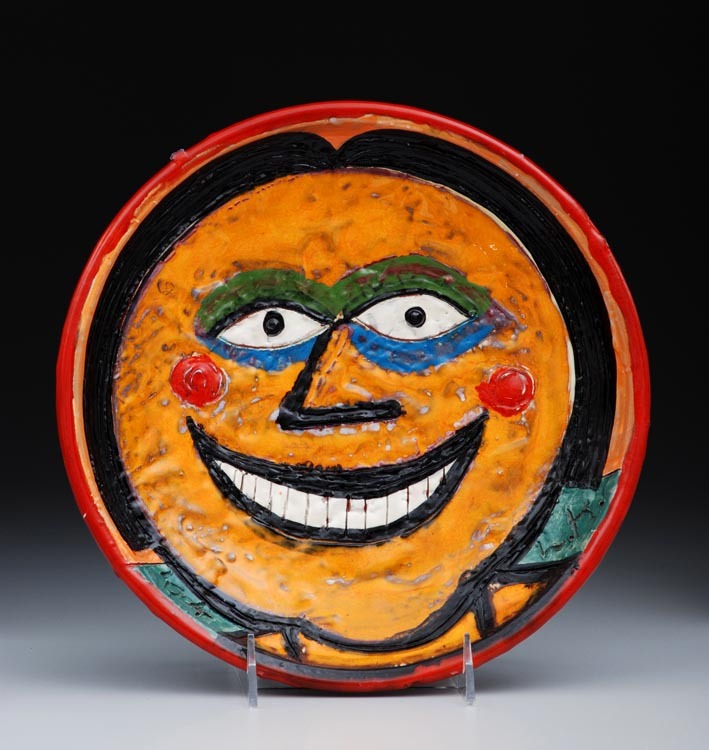 His most widely recognized work features organic porcelain forms with unbelievably beautiful glazes, many of them of a unique macrocrystalline variety. He is sixty now and lives with his wife, Anne, eleven miles north of Gainesville, Florida. Tilton plays rhythm guitar, seriously. Anne’s insights into the Tilton-Kesl partnership appear on page 47. Kesl lives right in Gainesville. He will be 79 years old this year and is something of a legend in Gainesville. To some friends there he is known as “the irresistible Lennie Kesl.” He also is irrepressible and inexhaustible. In the course of his life he has been many things: a member of the 30th Infantry Division that invaded Germany in World War II, a Fuller Brush salesman, a drummer, a recording vocalist of three LPs and a CD, a son, a husband and father, a painter, a sculptor, and an art professor. He and Tilton began their collaboration while both were teaching at Santa Fe Community College in Gainesville. The pots they make employ the techniques of commercial ceramic production but they also utilize the methods and sensibilities of fine studio pottery. The colors, glazes and kilns are exactly what you’d find at the local greenware/paint-your-own-pottery shop. But the clay is custom blended by Tilton, who also throws all the “blank” forms that Kesl paints. Like his own work in porcelain, Tilton’s blank pots hide his hand. The vessels are smooth, symmetrical, uncomplicated and perfectly suited to carry Kesl’s images. Unless you know about undercuts and wall thickness, you wouldn’t know that these pieces aren’t cast or jiggered. The yearly collaborations last up to six weeks and the product is divided equally. For the most part they keep the work in their own collections, occasionally loaning a group to be exhibited locally. Tilton will sell a piece once in a great while. Kesl’s are not for sale. While both these men claim to be somewhat reclusive, you can’t go anywhere in Gainesville with them and not be greeted by well wishers. Their fame as artists and musicians precedes them. Tilton is part of the Hot Club de Ville, which plays a monthly gig in town. Kesl sometimes joins them as a vocalist. But their love of music is not limited to public performances. In preparing the studio for this collaboration many years ago, the first thing Tilton installed was a first-rate sound system. The music plays for long stretches, day and night. The selections are an eclectic mix but favor Django Reinhardt, Stephane Grappelli, and the composers and lyricists of the great American standards. While the music plays, Kesl offers a captivating, free-association dialog on all matters: art, music, friends, foreign languages, world history and gems from his personal experiences. Today Kesl is wearing one of his father’s dress shirts. Consider that for a moment. Kesl was born in Edwardsville, Illinois, in 1926—the same year as Miles Davis and Marilyn Monroe. As a young man he met and was befriended by the sculptor, David Smith, and box/collage artist, Joseph Cornell. But in the main, Kesl’s insights about art are informed by his knowledge of music. Pitch equals value and volume equals intensity. In his world, the black hair on his figures is chosen because black sets the pitch for the orchestration of all the other colors. When discussing his compositions, he recommends we consider the interstices, the intervals. Look closely at the color and textural modulations that separate his shapes. His color mixing and application are a kind of phrasing, sometimes subtle and sometimes impetuously exaggerated. There is nothing postmodern, academic or pedantic about his commentary or his painting. All of his images, processes and theories are fluid and affirmative. This day Kesl is painting thirteen plates, the largest being 24 inches in diameter. Each carries the face of a young woman. Each face is eyes front, each head selectively proportional and comfortably composed within the circle. 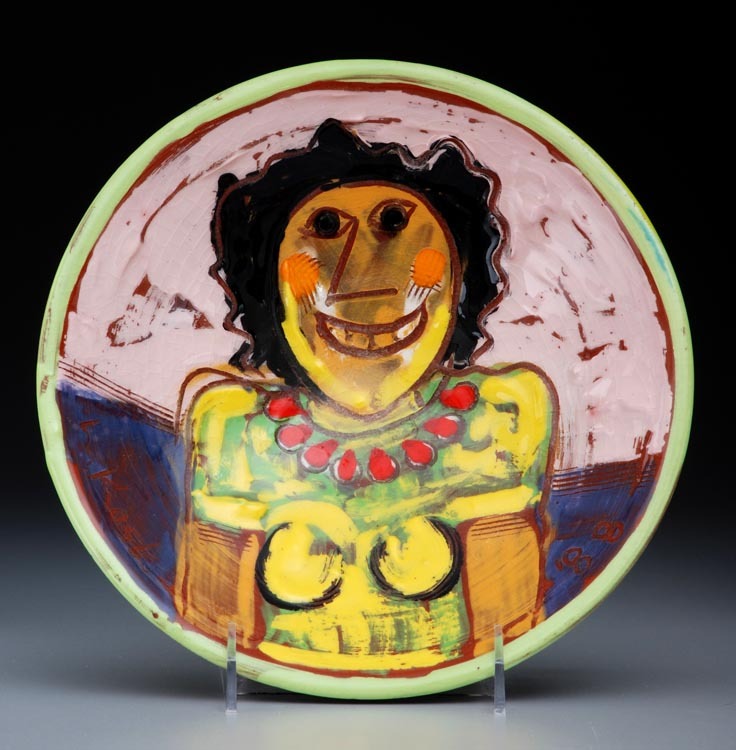 The exactness of the plate’s rim complements the nuanced irregularities of the hair. He paints slowly, precisely, reflectively. As he paints he recites a line from Henry David Thoreau, “Man is a tool of his tools” and then he turns a phrase about the nature of his subjects, the young girls, finding them to be “virtue on the hoof.” One of Kesl’s signature moves is the use of the underglaze bottle caps to impress cheeks and, sometimes, teeth. We are left to decide if this is a droll improvisation with the tools at hand—Thoreau—or a kind of shorthand not seen anywhere else in the work. It’s hard to know, but good art always raises a few questions. And in these pots we are reminded of the difference between talent and art. Talent applies itself and fills some space. Art, as seen here, goes in through our eyes and informs our minds. If it’s really good, then it lives in our hearts. This investment of talent, time and money raises the question “Why?” For each of these men, it’s the art. Tilton believes that this is work that should get made. And it needn’t be burdened by the demands of the marketplace. There is no rush to product. While he is in the business of being a potter year round, he also is wise enough to know that some of the best parts of life aren’t bought or sold. Kesl simply loves to work. And he loves to work with Tilton in the hope of making magic. As mentioned before, Kesl keeps his share of what he makes. 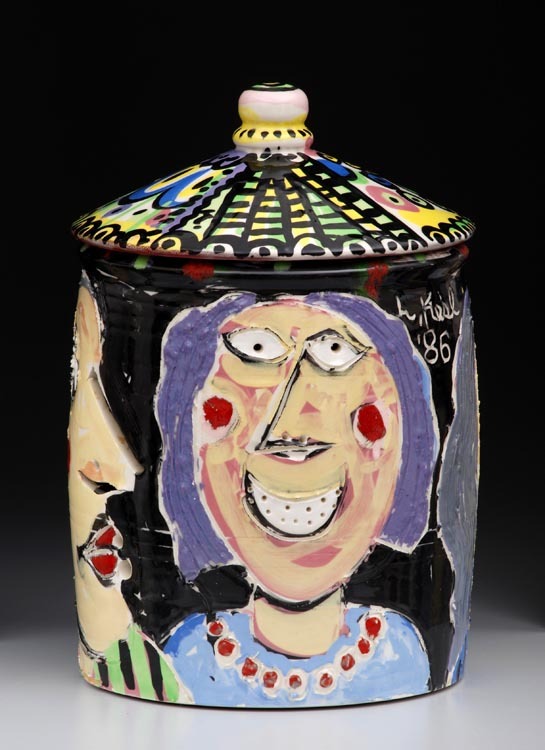 He is a true collector—of many things: drawings, paintings, books, ceramics, LPs, correspondence and pho­tos. Yet he is quick to note that we won’t be pulling the material world up through a hole in the clouds to heaven. The greatest truth is that the two of them, to use the old jazz expression, “really cook.” Kesl says that working with Tilton is like making surefire fudge. By his own admission, he doesn’t know that much about ceramics—but he doesn’t need to. This is a seamless team effort; no duplication of skills, no necessary steps avoided. There are serendipitous moments in this partnership and they occur with such frequency that it’s difficult to choose just one to retell. But here it is, and it stands for many others, all equally moving. Nor should we be passive viewers. It is not often that we come across a full body of mature work that has remained relatively un­known; especially work made for over twenty years. This partnership and these pots pro­vide us with a rare look at a sustained in­volvement of like-minded, knowing and passionate individuals. To say it again, these guys cook. Further information on the work of John Tilton can be found at www.tiltonpottery.com. The author, Don Pilcher, can be reached for comment at dpilcher2@juno.com. Central to making sense of the John-Lennie collaboration is the fact that their temperaments are complementary. On the face of it, they are opposites. John is reserved; Lennie is flamboyant. John makes pots that don’t show the hand; Lennie, as a courtesy to the viewer, makes rudimentary efforts to conceal his hand, but actually wants the viewer to see where he has been (to see, as he told John once, “how you’ve suffered”). Musically, John prefers to be in the background, playing rhythm guitar; Lennie likes to be in the foreground as a vocalist. When they divide up the pots after a working session, John and Lennie often want completely different pieces. These complementary inclinations help their partnership function smoothly. One reason for the lack of commerce may be that their sessions together serve as an escape from their normal lives. Lennie is “cocooned” with us. He is fed good food, sleeps in quiet and beautiful surroundings here, is shielded from interlopers and is shepherded through the flow of the pottery-making process by John (who truly fills the Good Shepherd role). Thus insulated from the concerns that normally invade his life, Lennie can live for a short, suspended time reveling in pure daywork. If Lennie’s experience is perhaps more tranquil than his day-to-day life, John’s is more stimulating. Used to working alone in porcelain, John switches to working in red earthenware, giving Lennie the run of the studio, and being bombarded with ear-blasting music and running commentary all day long. He comes away from their collaborative sessions feeling that (although his eardrums may have been damaged) his right brain has been stimulated and his horizons have broadened. If their working together were to become a commercial enterprise, the “escape from daily life” factor would be lost. Incidentally, the Gypsy Jazz music that they love, which was popular during WWII, may play a part in the “escape.” In the 1940s, with the War grimly raging, people would leave their cares behind and dance to this music in the dance halls of Paris. It’s possible that Gypsy Jazz music, which is experiencing a resurgence in popularity today, promotes that feeling of freedom from boundaries. In addition to Kesl’s composition and imagery, there is a good deal about the underglaze and glaze application that accounts for the success of these pots. 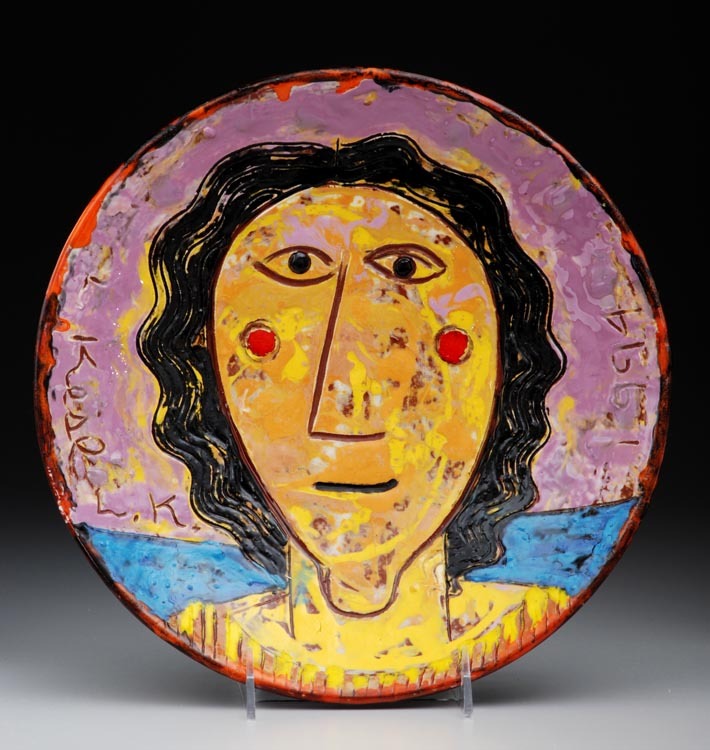 Unlike the figurative ceramic works of Picasso or the village potters in Mexico, whose work is primarily single stroke, Kesl builds the color over days of patient application. In this particular series, he has incised the features and then added as many as twenty layers of color over a spat­tered ground, not unlike stucco. Sometimes he thins the color, other times he applies it like cake batter. In two instances, he applied dried out and crushed underglaze like chopped nuts to a freshly painted pool of contrasting color. The result is a complex and vibrant pastiche that responds with satisfying intensity to the later application of glazes. This is not an inexpensive undertaking; Tilton has as­sembled an amazing quantity of pigments. Including underglazes and glazes (a clear, and several brilliant yellows, oranges and reds), they have nearly 500 jars of color on hand. They go through the catalogs together and Kesl decides how many of each color he wants. And there are new ones yet to try. Tilton brushes three coats of clear for the glaze firing. Each piece is fired at least twice and as many as four or five times until the image is right. A word about the firings: Tilton brings a commitment to detail that might never occur to some of us. For example, when using self-supporting cones, he uses a bubble level to set the shelf so that the cone is always true to level for each firing— tight is right. And he fires the cones by visual observation so that the potentially fugitive cadmium-selenium hues don’t escape. This seems like a throwback in this age of programmed firings, but it’s a practice that is typical with labors of love.